Reubens, we make the best one in the state, probably the best one you ever had. The Seneca Salad – is a favorite! Featuring a double house salad topped with a grilled or crispy chicken breast, bacon bits and dried cranberries with your choice of dressing. Grilled Chicken Dinner – Our marinated and char-grilled 6 oz chicken breast comes with your choice of two country sides and a Southern Style Biscuit. Hot Roast Beef Dinner – A generous serving of our roasted and pulled Angus beef comes with your choice of two country sides and a Southern Style Biscuit. 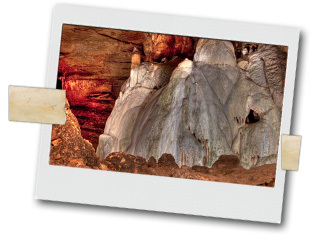 Cavern Burger – The cavern burger is a classic 7 oz steak burger for a hungry caver. It comes with American cheese, mayo, lettuce, tomato and red onion. It is served with chips and a pickle or add our seasoned French fries. 2 PIGS AND A COW – Our one-half pound BBQ steak burger is made with smoky B.B.Q sauce; char-grilled with apple wood smoked bacon and ham, served with chips and a pickle, or add our seasoned French fries. Now that is a BIG BURGER for the Hungry Meat Eater! Check our Facebook page for the weekly specials and Sunday Specials! 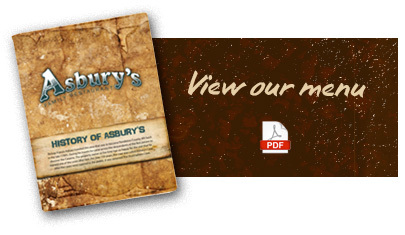 Asbury's is a full service restaurant, we can take care of your groups and tour busses with special menus. Do you have an event that you need catered? Let us know and we can design the menu of your choice. We can cater private dinners for up to 75 people if requested. Please allow two weeks prior to the event. We can also cater private Christmas dinners, rehearsal dinners and family or class reunions. If you want to cater an event please contact "Liz" Harper, Manager at (304) 567-2691 or by e-mail at least two weeks prior to the event!